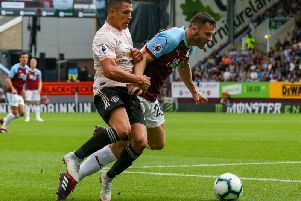 Burnley earned a first win in seven games with a 4-0 romp against struggling Charlton Athletic at Turf Moor, as Sean Dyche hailed his side's second half display as their best of the season. Scott Arfield scored either side of half-time, before Andre Gray hit his 12th goal of the season, and Sam Vokes completed the rout, in Dyche's biggest league win of his Turf Moor tenure. Burnley consolidated fifth place, on a day where Brighton suffered their first defeat of the season, while Hull City - Burnley's Boxing Day opponents - and Ipswich Town also lost. And Dyche said: "The second half was as fluid as we've been, the more relationships build - we had two changes and yet the team looked as good as it's been. "The biggest thing in the game is taking your chances. We've had chances to kill games off and we haven't the last six or seven games, and today we have. "Thats one of the defining things. "The conditions were not helpful for either side, and there was a flatness to the game in the first half, it was maybe part of their game plan to take their time with things, which often happens here. "We created two or three great chances, although they had one on the counter, and we scored the goal. "After that it was one-way traffic for most of the second half, certainly with the quality and chances created - that's not being disrespectful to the opposition, I just thought that was a fact." Dyche felt his team were just falling the wrong side of tight margins as they went six games without a win, and added: "It not been miles not like it in my opinion, and I'm the manager. I don't try and spin anything, the margins are tight. "If we'd have taken our chances like that against Preston, it could have been the same outcome. "We had so many chances, and let in two soft goals. We didn't let two soft goals in today and that could have been even more than 4-0. "Some of the goals were terrific, the demand from the team to score different types of goals. "I want mixed football, aggressive passing - not long ball, because you can see it's not that - I want to play with a purpose, on the front foot, full of energy. "Second half particularly that was on show." Dyche made two changes to his side, bringing in Vokes for David Jones, and Matt Lowton for his first start, in place of Tendayi Darikwa, and he explained: "Lowts has been patient and waited for a chance. Tendayi has done fantastically well to come out of League 1 and straight into the side and deliver the performances he has...David Jones, fantastic - probably one of the toughest decisions I've had to make in my time here was leave him out. "I just felt it was a time when change was needed, and Dean Marney was excellent - two games in a week as well, so his fitness will improve, his mental fitness and belief in himself. "Joey was excellent and there were so many good signs, I'm delighted for Vokesy to get a goal, he's been waiting, working hard and he looked sharp, particularly second half. "Andre stuck at it - he has that fearlessness, if he misses a chance, it doesn't bother him. "He missed two or three then comes up with a sublime finish."